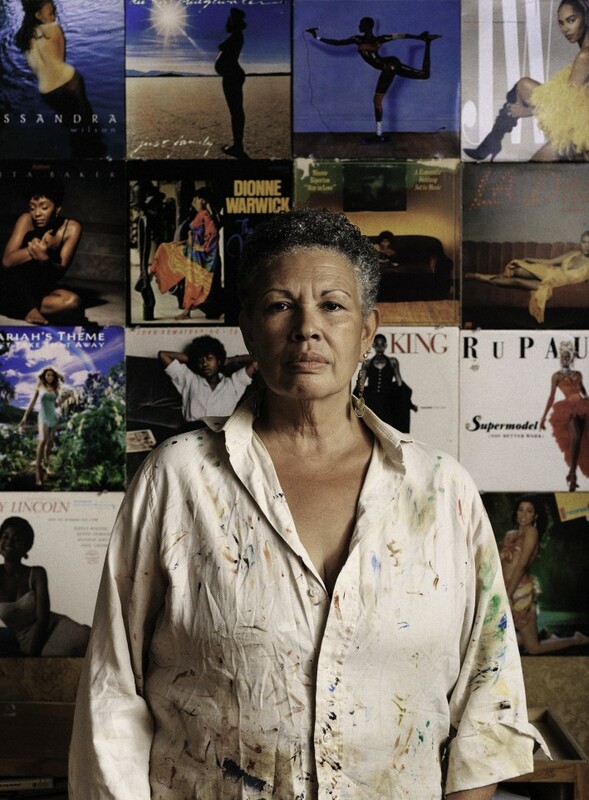 Currently viewing the tag: "beyonce"
Margaret Rose Vendryes is an artist, historian and curator whose subjects, in her imaginative and gender focused exhibit, The Africa Diva Project, are all strong, black, female solo artists. She explores the role of gender in African and contemporary society through these music legends. 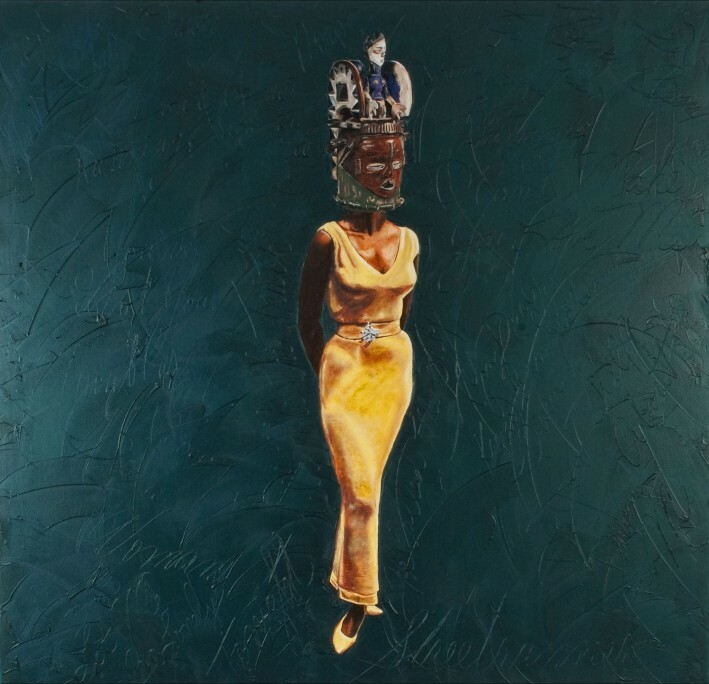 The images of the women are taken from their vinyl album covers and surrounded by song lyrics but their faces are covered with exquisite African masks, traditionally worn only by men. Tina Turner, Grace Jones, Anita Baker, Diana Ross, Beyonce, Nancy Wilson, and first diva Donna Summer are among some of the extraordinary singers this artist has captured on paper and canvas, and they immediately strike you as beautiful and powerful. In the music business, getting to the top as a female solo artist is a tough road but Margaret actually sees them as being very vulnerable. This is her first commercial gallery show and the paintings can be seen through July14th at Child’s Gallery on Newbury Street. Child’s curator Richard Baiano is such a fan he owns the Nancy Wilson, draped in a stunning yellow, floor length gown. Margaret began the series in 2005 and the oil and cold wax paintings, priced from $8,000-$15,000, have taken up to 5 mos to complete. Did you sit through the endless red carpet coverage? I did. I’m pretty sure I lost some IQ points and all I wanted to do was feed Giuliana Rancic a sandwich, but I powered through it. Ryan Seacrest just needs to embrace his vertical challenge and start standing on a phone book because when he interviews people like Taylor Swift or Nicole Kidman, he looks like a 12 year-old. It’s so awkward. Kat McPhee looked like a deer in the headlights when she was interviewed by Seacrest. I mean they KNOW each other right? Why was she so weird? I’m thinking it’s because she forgot to wash her hair. Ariana Grande was interviewed with her new guy Big Sean and he was her biggest accessory. The level of cuteness was pretty high on the nausea scale, I mean she wanted everyone to know “this is my man and you can’t have him”. Look girl, if you want a man that will take your inevitable breakup and use it to write a marginally interesting song that will be played on radio stations everywhere, then you do you. I look at this and I think about my ex that I brought to my sister’s wedding. He’s in the pictures and I wish he wasn’t. I feel like when Ariana looks back at these pics after the public breakup, she will wish she hadn’t hung all over him like a cheap suit. I’m not a fashionista by any stretch of the imagination, but here are my picks from the red carpet. BEST: Taylor Swift, Chrissy Teigan, Jessie J and Gwen Stefani. WORST: Rihanna (WHAT WAS THAT?) Iggy Azalea’s hair crown, Kim Kardashian’s bedazzled robe and Keith Urban’s ponytail. New England Patriots will be on stage? What!! I had no idea. I was hoping for a Grammy Gronking, but Edelman and Butler did pretty well with a well-played interception joke. Kanye West put on his best sweats to Auto-Tune his way through a crappy song. Someone please explain Kanye and his “art” to me, because I don’t get it. Keith Urban has a ponytail? Stop. Just stop. I felt the song with Paul McCartney, Kanye and Rihanna was all over the place. Matching black suits? Is it me or did Rihanna show NO skin this evening? Something is wrong in the world somewhere. The song is good, but I just can’t listen to Kanye sing. Mostly because he can’t. And Paul just looks so out of place. And constantly surprised. The Grammy’s were far too long and peppered with performances that truly sucked (Usher singing Stevie Wonder) and performances that delivered (Madonna, Beyonce and Tom Jones) but it’s the one time where I will sit in front of the TV for hours on end that doesn’t involve Netflix. First Ladies have been prized and scrutinized for fashion choices all the way back to Dolley Madison’s gorgeous butterfly embroidered inaugural gown in 1809 –and Mary Todd Lincoln’s critiques who found her love of bold fashion was a little too much for the Civil War-era. All First Lady wardrobe choices have undergone public examination– from Nancy Reagan’s fiery red outfits to Jacqueline Kennedy’s pink Chanel suit to Michelle Obama’s red and black election night victory dress– as if a garment could ignite a war. However, at a point when women are at the top of their game in the work force and in their personal lives, should we really be focusing so much attention on what our First Ladies look like? 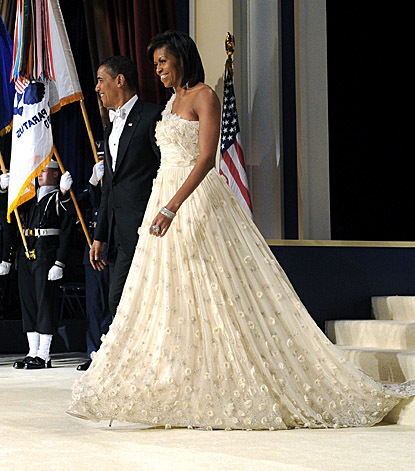 Most of us can note that Mrs. Obama was involved with childhood obesity and military families for the past four years–even though it is way more fun to talk about her insane biceps and totally fierce inauguration ball gown she wore while dancing in the arms of her super handsome husband to Beyonce’s rendition of “At Last.” For many of the presidents’ wives throughout American history, they took their husbands’ election and created extraordinary breakthroughs for women, minorities, children, addicts, the sick, soldiers, the working class and more. 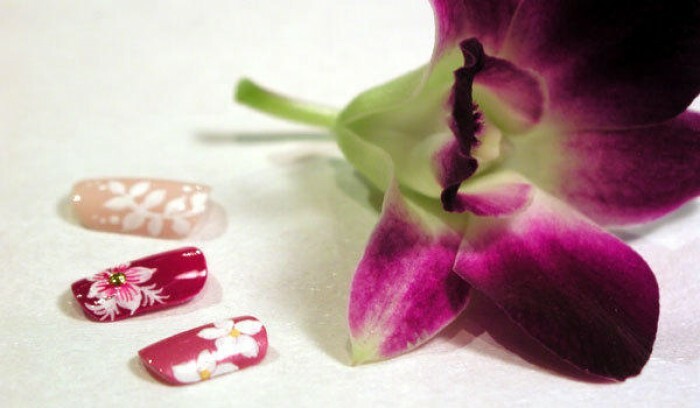 When I was growing up, my mom had this rule that I couldn’t paint my nails until I was 16. So naturally when the time came, I went crazy. I bought bottles of nail polish left and right, of all colors. Red. Blue. Yellow. Glitter. I was the queen of nail painting. Since I had no experience painting my nails, I was also terrible at it. Absolutely horrible. The coats weren’t even, the colors were off and in the end, my fingers had their own coats of polish. It just didn’t look good. So it was settled: I couldn’t paint my nails. But I was 16 and it was finally time! I refused to give up so easily. Thus began my longest relationship ever, the only one that never brings heartache and disappointment, between my manicurist and me.